Blackmore is a Japanese steampunk-inspired adventure from some of the creative minds behind Silent Hill, Metal Gear and Snatcher. We're living in an age where a new video game Kickstarter isn't necessarily news by itself -- but when there's talent of the caliber displayed by new project Blackmore involved, you should most certainly pay attention. Blackmore is a new adventure game project designed as a collaboration between a number of ex-Konami developers, many of whom previously worked on high-profile Hideo Kojima productions. The team consists of Jeremy Blaustein, who previously worked on dialogue, localization and voice recordings for Snatcher, Metal Gear Solid and Silent Hill for Konami, plus the wonderfully crazy Shadow Hearts series; artist Satoshi Yoshioka, who previously worked on Snatcher and Policenauts; and musician Motoaki Furukawa, whose past work includes Gradius and Snatcher. Blackmore is a steampunk-inspired experience in which you play as Emma Blackmore and her robot sidekick Descartes. In the game, you're tasked with tracking down a serial killer who is terrorizing the people of East London, and in turn coming to terms with the seedy underbelly of the city and the darkness in human hearts. 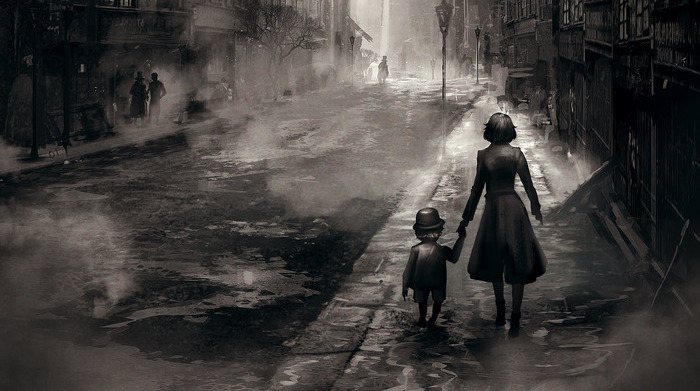 Blackmore's take on London is an alternative, fantastical take rather than a realistic depiction. 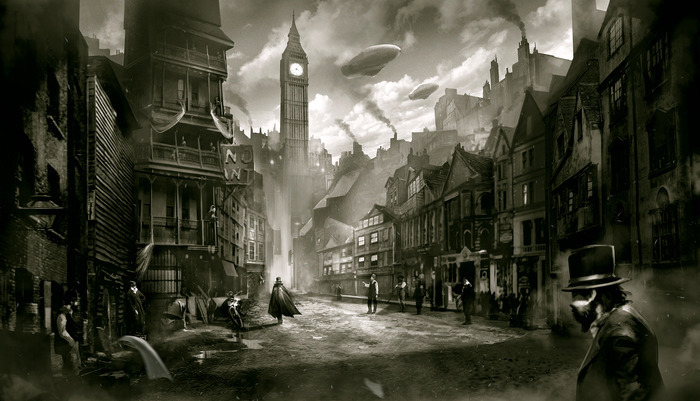 Based loosely on the Victorian era (think Sherlock Holmes), Blackmore's interpretation of the British capital blends European and Asian fashions and aesthetics with ornate, steampunk gadgets. Emma Blackmore herself is half-Japanese, and the daughter of an eccentric English inventor and nobleman. The gameplay will unfold from a hand-drawn 2.5D perspective, and will consist of point-and-click adventuring in the traditional sense -- finding objects, solving puzzles and questioning characters for information. Emma also has a number of gadgets at her disposal, including a monocle equipped with a camera and forensic analysis equipment. Handy! The project is born from Blaustein's own confession that he doesn't have the reflexes for modern 3D twitch-based games. "I'll never be a great 3D game player like I was back in the days of flat, side-scrolling games," he writes on the project's Kickstarter page. "But there was always one type of game I especially loved -- call them graphic adventure games, visual novels or point-and-click games. I grew up playing the Sierra point-and-click games, but it wasn't until I saw 'Snatcher' that I really felt the magic of what was possible. The art, the music, the Japanese 'feel' of it. It was like all the Japanese cartoons I had watched as a kid, but suddenly made into an interactive game! I couldn't get enough of it." It seems that it's not only developers spurned by Kojima that are keen to jump on board with the project, either -- a very familiar voice has been recruited by the team to play the role of Emma's brother Jonas, head of the Blackmore household: Mr David Hayter, of Solid Snake fame. "I wasn't planning on doing too many more Kickstarter campaigns, but this one is being written and directed by a friend of mine, Jeremy Blaustein, who I got to work with way back in the day on the first Metal Gear [Solid] game," said Hayter. "I took a look at the character and some of the artwork, and it really looks like it's going to be spectacular." Tagged with blackmore,	davidhayter,	jeremyblaustein,	Kickstarter,	kojima,	News.